Who will I eat lunch with today? Which of all these new people might end up being my friends? We've all been the "new kid" wondering how all of this is going to go. Yes, even future physicians, pharmacists, nurses, and other health and science professionals. Wouldn't it be great, in that first year, to see a familiar face among the older "kids" who seem to have it all figured out? That's the idea behind an innovative mentoring model being pioneered by the UNMC College of Pharmacy. In it, Pharm.D. students and faculty are grouped into "families." Why? 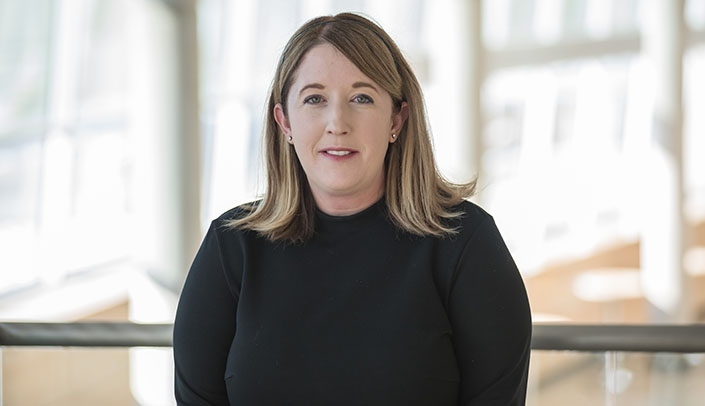 "Our previous advisory system wasn't always personal," said Kristen Cook, Pharm.D., clinical assistant professor of pharmacy practice. In pharmacy families, each faculty advisor is grouped with two or three students per year level, P1-4. First-year students are mentored not just by their faculty advisor, but also informally, by the older students. You know, the folks who have survived that first year, and now know a thing or two. "When I was a student," Dr. Cook said, "I had no idea who the P3s and P4s were." Never mind being able to "know" them enough to ask for advice. But the pharmacy mentoring program gets the family together - or, rather, the P1s do. Yes, it's the job of the first-year students to arrange family meetings. That can be a tough thing to do, especially for first-year students - but, we are learning networking skills, here. "It forces them to put themselves out there," Dr. Cook said. These get-togethers are informal by design. They are often off campus, at a happy hour or restaurant. "I am a big proponent of icebreakers," Dr. Cook said. She hypothesizes that students who get to know her outside of an official setting are less likely to hesitate with real questions. Same with their peers. "We aren't necessarily going to be your 'friend' group," Dr. Cook said. "But you start to realize this is a professional group that can help you." It's a network. You know someone. This is the second academic year that pharmacy families are getting together once a semester. Initial surveys said the program has been well received. It's nice, as a new kid, to see a familiar face. Nicely done Kristen! Great idea.